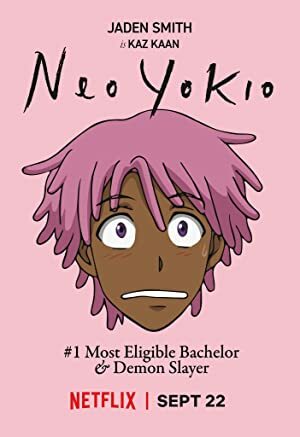 Neo Yokio – Season 2 (2017) – What's New on Netflix Canada Today! Welcome to Neo Yokio, the greatest city in the world. It’s the most populous urban agglomeration in North America, but its prestige does not merely stem from its size. Neo Yokio is a diverse labyrinth of cultural and architectural innovation at the forefront of global fashion and finance. All of this is cold comfort to the lovesick Kaz Kaan (Jaden Smith), the youngest member of a family of: “magistocrats” – pink-haired demon slayers who once liberated the city. Today, his demon-slaying is barely more than a side-hustle coordinated by his Aunt Agatha (Susan Sarandon) – Kaz himself would rather concern himself with shopping, field hockey and – of course – mending his broken heart. Always by Kaz’s side are his faithful mecha-butler, Charles (Jude Law), and his inseparable friends Lexy and Gottlieb (The Kid Mero and Desus Nice) as he navigates the complexities of life in Neo Yokio and tries to stay one step ahead of his arch-rival, Neo Yokio’s number one most eligible bachelor, Arcangelo Corelli (Jason Schwartzman.) Things take a mysterious turn when Kaz is drawn into the turbulent world of ex-fashion blogger Helena St. Tessero (Tavi Gevinson), setting in motion a sequence of events that force him to question everything he knows about Neo Yokio. Mourning the death of a recent relationship, an elegant and fashionable demon hunter struggles to stay afloat in the elite society of Neo Yokio.